Thu., Sept. 1, 2011, 4:30 a.m. The balloons are back - this week is the Spirit of Boise Balloon Classic, in which dozens of colorful hot air balloons launch in the morning skies over Boise. About 30 are scheduled to participate; this photo from yesterday shows the first day's launch, which included less than half that number as balloon teams continued to arrive in Boise for the annual event. Long associated with the Boise River Festival, the scenic balloon rally continued after the demise of the festival in 2002, and returned last year after a three-year hiatus. 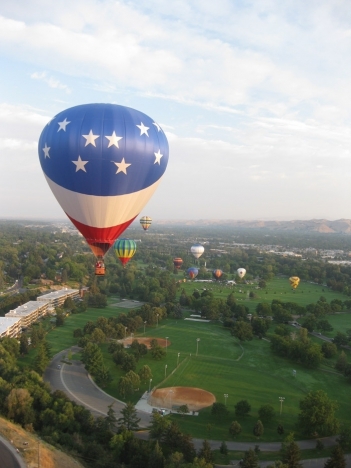 More balloons are scheduled to launch this morning from Ann Morrison Park in downtown Boise; they'll also launch around 7 a.m. on Saturday, and Sunday, with a "Nite Glow" and free concert in the park Friday from 6-9:30. Also planned are morning military aircraft flyovers, balloon flight competitions, and food and coffee vendors in the park for those who want an up-close look at the launch. Scott Spencer, the balloon classic producer, said yesterday's wind conditions meant a unique flight path to southeast Boise. "It's the first time in more than 10 years we've had the opportunity to fly in that direction," he said.